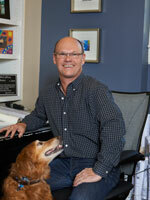 For firm founder, Steve Ekman, "form follows function and function dictates form". Steve has strived to master the integration and interaction of architecture and landscape, engaging light, view angles and focal points into each design project. From these focused elements to a variety of architectural styles, he explores each aesthetic and its unique characteristics of mass, scale and form, in addition to the sympathetic details and materials. Comprehensive solutions are a matter of in-depth collaboration under his mentorship. By establishing rigorous design criteria through clear verbal and crisp graphic presentation, Steve guides the clients and design team through the project’s design process. He brings to the surface the architectural potential of the project’s needs and the client’s desires through his design excellence. Balanced classical proportions, memorable compositions, and the intelligent use of expertly crafted details are the firm’s signature trademarks. As a graduate of the University of Colorado with a BS in both Small Business Management and Environmental Design, Steve began his career as an apprentice at WED Enterprises – Walter Elias Disney’s Imagineer Division, where the “Imagineer” team design concept, through the tutelage of Roy Disney and Jim Park, was instilled through the design of the Japanese Pavilion at EPCOT. Before establishing his own firm in 1995, Steve honed his architectural talents in Denver at the firms of Earl A. Anderson and Associates and Sears Barrett Architects, Inc. Steve has a wealth of knowledge in residential architecture and construction techniques. He has onsite experience and distinguished firm management over the past thirty years and is committed to the community through Civic and Youth Development Programs. Steve presently serves as a board member on the Littleton Historic Preservation Board, the Board of Historic Denver, and the Littleton Soccer Club’s Community Development Board. He currently is member of the American Institute Of Architects, Historic Denver, Inc., The Institute of Classical Architecture & Classical America, Historic Littleton, Inc., and the Colorado and United States Youth Soccer Associations. After twenty years of studying and practicing in the decorative and fine arts, Dean has returned to architecture with a passion. His experience in design and construction as well as interior architecture for over twenty years has given him a unique perspective that benefits every project he touches. Dean’s inspirations include the modern masters of the 20th century—Wright, Neutra, Fehn, Saarinen, and Eames—and their influences and are apparent in his furniture and building designs. The passion of an artist is often their expression of freedom, and as such, Dean can often be found on his motorcycle wandering the Rocky Mountains with family and friends. He is a member of several affiliations including American Institute of Architects, Historic Denver, Inc., American Motorcyclist Association and the Colorado Off-Highway Vehicle Coalition. The best part of working on a historic structure is that you park one’s ego at the door. 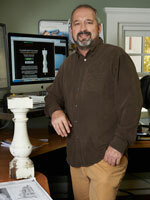 Preserving historic structures for more than 25 years, Gene began his career as a restoration carpenter in Vermont. Moving to the U.S. Virgin Islands, Gene led two church restoration and reconstruction projects for the National Park Service. His continued work in the Virgin Islands extended to more than two-dozen restoration and rehabilitation projects, all 19th c. Danish colonial structures. Relocating to Colorado, Gene specialized in log and timber design-build and preservation work. 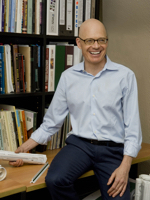 He then enrolled in graduate school and completed his Master’s degree in Architecture and a Graduate Certificate in Historic Preservation in 2005. Gene’s recent work includes expert consulting for the California Parks Foundation during the Vikingsholm Castle Log Roof Reconstruction Project, Historic Structures Report for the John Collins United Methodist Church in Denver, consultation for South Suburban Parks & Recreation for the Carson Nature Center and for the City of Littleton's Historic Preservation Board. While on staff at Ekman Design Studio, he has rehabilitated a Denver 1888 Queen Anne home. Genes other preservation projects include historic homes by notable Colorado Architects; such as Jules Jacques Benedict, Harry Edbrooke, Fisher & Fisher, and Burnham Hoyt. He is a member of The Association for Preservation Technology International - Rocky Mountain Chapter, American Institute of Architects Associate Member, Historic Denver, Inc., and The Institute of Classical Architecture & Classical America. After receiving a degree from the School of Architecture at the University of Colorado, Boulder in 2007, Ryan joined Ekman Design Studio. Ryan brings passion and enthusiasm with his willingness to learn the proven techniques of the past while adding new life to the region’s historic architecture, as well as new designs. He excels at computer modeling and visualization techniques necessary to each project. Ryan is active in the community as an ACE Mentor. "Each project begins with a problem-solving phase that is very satisfying on it’s own. But it is the refinement of that design into architecture where beauty is created. There is nothing more rewarding than a client saying that the end result of their project exceeded their hopes and expectations." In 2015, Peter brought not only his talent and years of experience as a licensed architect to Ekman Design, but also a wonderful passion and enthusiasm for architecture. 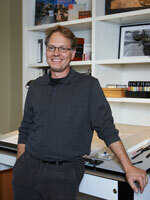 Peter earned a Master of Architecture degree from the University of Texas at Austin, where a strong studio program was complimented by an emphasis in construction, history and theory. Prior to joining the team at Ekman Design, Peter worked at several highly regarded firms in Colorado and New York City specializing in custom residential architecture and interior design. His experience working in both traditional homes and those of modern style, interior and exterior architecture, and his emphasis on client relationships blend well with the philosophy at Ekman Design. Peter’s personable approach recognizes the importance of a homeowner’s lifestyle and personal taste. As a project architect, Peter has been recognized and awarded by the AIA Denver, the Colorado Awards for Remodeling Excellence, and the Newman Awards for some of his outstanding projects. He has also been published locally and in national magazines. 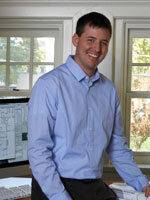 Peter Boes is a licensed architect in the state of Colorado. He is a member of the American Institute of Architects (AIA), the Institute of Classical Architecture and Art (ICAA), is active in the Denver design community as well as a member of the Design Council at the Denver Art Museum.